When my now 17- and 15-year old sons were brand new, our days were filled with wonder, excitement, sticky hands, and tears (sometimes the boys would cry, too). Our weekly trips to the library for story time, our favorite park by the Arkansas River, and driving to the top of Mt. Nebo to watch the tame deer walk on the same trail we were on was…awe inspiring. Many times, as I would push the boys on the swing, I would look up at the perfect blue sky and try to burn that moment in my memory. Time was slow. They were too little for any sports or activities; we had not yet experienced rushing out the door and getting frustrated because flip-flops weren’t the proper footwear for soccer games. Our daily routine wasn’t rigid, which allowed us to find the richness of life in even the mundane. We could sit in the lush grass with a magnifying glass and gaze at the comings and goings of a ladybug. We could hold rock-skipping contests at the river. We could visit the Dollar Tree to see what treasures awaited. Through the eyes of my children, the world was new and everything in it was good. Each new season and new person we met held the promise of great adventure. Eventually, our park visits and magnifying-glass explorations were replaced with baseball practices and homework. Making spaghetti was no longer as exciting for my children as it once had been. Looking at the sky and trying to burn moments in memory became less frequent. It wasn’t a sad or dark time. No one was experiencing a health crisis (unless you count puberty…which is a valid argument). There was no death in our family, but nevertheless, there was loss. In a nutshell, here is what happened: The boys grew. We added sports, school, a new brother, several job promotions with moves to new places, bigger mortgages, more homework, college plans, retirement plans, vacations plans…life. Crayons were replaced with mechanical pencils, which were then replaced with laptops. Mickey Mouse Club House was replaced with The Walking Dead. Magnifying glasses were replaced with Instagram, and awe was replaced with busyness. Somewhere along the way, we forgot to slow down and be observers. Somewhere along the way, I forgot the warm, enrobing feeling of awe. Anyone who has been around young children knows that they have much to teach adults about the awe of life. Remember, it was not all too long ago that we were little children with wide eyes, ready to take in everything the world had to offer. Before deadlines, mean people, disappointments, and rigid schedules, we were brilliant at recognizing the extraordinary. We used to be really good at appreciating how our legs feel when we run as fast as we can; the smell of a warm breeze on our faces; and the joy of catching bubbles with our palms. Children live each moment as it is unwrapped like a gift. Tomorrow is an abstract thought, but today is tangible. Today is here. Today is when our lives happen. If we are not careful, we will miss opportunities to be inspired. My moments have changed slightly. Now I find awe in grand sunsets full of pinks and oranges, hearing the gentle song of my wind chimes hanging off of my back awning, and the fleeting smile of my teenagers. I find inspiration in family dinners where we laugh so hard one of us has to go change her pants (for the sake of privacy I will not reveal who it is….ok, it’s me, but don’t judge). I recently heard someone say that the days are long, but the years are fast. For a while, I didn’t really grasp that statement. Now, I not only understand, but I see the wisdom in it. Everyday tasks are important. If I don’t do laundry, someone in my house will be naked. If I don’t buy groceries, we don’t get to eat. If I don’t clean the toilets, then no one will want to come to my house. The trick to keeping the awe as adults is to find moments within the mundane that are extraordinary. My wish for you is this: May you find awe in everyday moments. May you never forget that your life is bigger than your job or to-do list. May your time slow down enough so you can observe ladybugs in the grass. May you learn from Mother Nature’s rhythms and find peace. 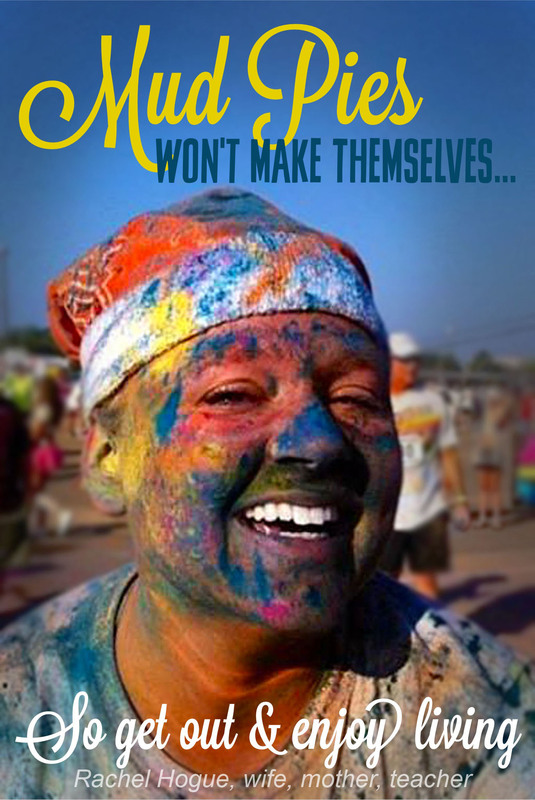 Those mud pies will not make themselves, so get out there and enjoy living. Loved this! So true! You have such a gift of writing!! What a perfect reflection!